First Friday Reception, November 2 • 5-7:30 p.m.
Marc Castelli’s one-man exhibition, “Minding the Dogvane,” continues through December 1. This year his 25th anniversary exhibit features over 40 new watercolor paintings with a full range of subjects guaranteed to delight both collectors and those new to his work. 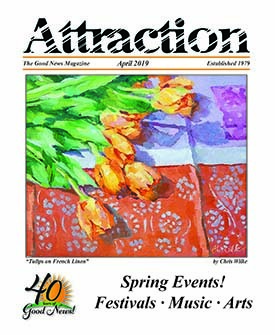 For additional information, contact Carla Massoni at 410-778-7330 or visit www.massoniart.com. November 1 • 7 p.m.
Based on the Jacob Lawrence Migration Series panels, five playwrights created five new short plays for the Philips Collection’s 2015 exhibit of the full panel series. Produced by visiting artist Jacqueline Lawton, (Chairman, Theater Department, UNC Chapel Hill) and Directed by Washington College Theater Department Chairman, Michele Volansky, the five plays will be presented in staged readings, followed by a revival performance of Kent County’s own Migration story, “Red Devil Moon.” “Migration” is a multi-faceted program of the KCAC, partnering with Kent County Public Schools, Chestertown RiverArts and The Garfield Center for the Arts. The program culminates with an exhibit of student artwork based on works of Jacob Lawrence at RiverArts and four nights of Words and Music at the Garfield including five new short plays on November 1 through 4. Call 410-778-3700 for a full schedule of events. The fifth selection in the Chestertown Environmental Committee’s 3rd Annual First Thursday Film Series, “Let Go of the World,” is a free film offered to all interested members of the public. Doors open at 6:45 p.m. Call 443-282-0023. November 2 • 4 p.m.
Come listen to an informative history lecture while enjoying a glass of wine. For details, call 410-778-3499. How is rhetoric used in journalism, politics, and public relations in this day and age? Panelists from each of those fields will illuminate how rhetoric or “spin” has shaped American culture in the last two years, with some discussion of relaying information and facts in a “Post-Truth” society. For details, call 410-810-5768. November 2 • 5-8 p.m.
Each month on First Friday, the Downtown Chestertown Association hosts this progressive open house. Businesses keep their doors open later so everyone can enjoy gallery exhibits, unique shopping, special performances, kids’ activities and a variety of dining options. For more information, email downtownchestertown@gmail.com. November 2 • 7:30 p.m. The Emmanuel Church (Chester Parish) presents a concert that is ideal for the entire family. KidSPOT is a hands-on creative learning center for children aged 2-12. Every Saturday, free of charge, the center is a destination for area children where they can look forward to interacting with a variety of stimulating activities that expand their horizons. For details, call 410-778-6300. November 5 • 7:30 p.m. The Live Playwrights’ Society for Play Writers, Readers, Observers and Critics aims to foster a community of playwrights, actors and critics. This group meets the first Monday of every month at 7:30 p.m. and is open to all ages. For more information, visit http://liveplaywrightssociety.org. November 9 • 7:30 p.m. The Boys Choir of the State of Maryland will present a concert of choral music. For details, call 410-778-3477. November 10 • 9:30 a.m.-12:30 p.m. The Goosebump Jump benefits the Kent Center family. Proceeds from this event will provide flexible and accessible transportation options to promote community inclusion and independence. Since 1970, Kent Center has ensured the safety and wellbeing of people with diverse abilities through personalized supports, essential training, open communication, and community partnerships. Call 410-778-7303 for details. November 10 • 6:30-11 p.m.
Las Vegas-styled Casino Night fundraiser with “celebrity” dealers from the community. Proceeds support health care excellence and the people proudly served by UM Shore Medical Center at Chestertown. There will be craps, roulette, blackjack, poker and more. The $200 admission includes a $100 donation, heavy hors d’oeuvres, signature cocktail upon arrival, live entertainment, dancing and fabulous prizes. Cash bar. For more information, call 410-810-5660. November 12 • 4:30-6:30 p.m.
Erika L. Sánchez is the daughter of Mexican immigrants, and is a poet, novelist, essayist, and the author of a collection of poems, Lessons on Expulsion (Graywolf, 2017), as well as the young adult novel, I Am Not Your Perfect Mexican Daughter, which was a New York Times Bestseller and a National Book Awards finalist. Her poems have appeared or are forthcoming in many prestigious literary journals. For details, call 410-810-5768. November 15 • 5:30-7:30 p.m.
Acclaimed journalist and author, Wil Haygood, will discuss his new book, hailed by Kirkus Reviews as “an engrossing tale of one shining moment in dark times.” Written largely during his sojourn at the Starr Center, Tigerland traces the story of a racially segregated high school that, amid the turmoil following Martin Luther King’s assassination in 1968, won state baseball and basketball championships. Call 410-810-7161. November 17 • 8:30 a.m. Entrance is free. Silent auction, Elegant elephants, Collectibles, Hand knitted items, Pre-owned jewelry, Plants, Christmas and Thanksgiving decorations, Gourmet goodies. Lunch is from 11 a.m. to 2 p.m. Preview Party is November 16 at 6 p.m. Cost is $15 at the door and includes wine bar and hors d’oeuvres. Proceeds to support various local charities. For details, call 410-778-7836. November 23 • 6:30-8 p.m.
Members of the Kent County Community Marching Band herald the arrival of Santa Claus to Chestertown. Classic holiday characters join the fun and dance with the crowd. November 23-24 • 10 a.m.-4 p.m. The Country Crafts Guild presents handmade crafts, including jewelry, Christmas decorations and ornaments, folk art, wood boxes, furniture, trivets, plant stands, acrylic paintings, photography, notecards, needlework, knitting, crochet, shell crafts, soaps, lotions, local wildflower honey, potpourri, teas and herbs, glass bottle art, etched glass, wreaths, swags, trees, fishing lures, fish carvings, decoys, wood bowls, cutting boards, pens, quilts, wall hangings, placemats, machine embroidery clothing, tote bags and linens. For more information, call 410-778-1432. November 24 • 10 a.m. This holiday tradition features fire trucks, classic cars, marching bands, floats and Santa. Email downtownchestertown@gmail.com. November 24 • 10 a.m.-5 p.m. Celebrate Small Business Saturday in Downtown Chestertown. Following the Kent County Christmas Parade, pick up a Shopping Passport. Local retailers are offering special Small Business Saturday discounts. Redeem an offer, make a purchase, and collect stamps in your passport. Each stamp earns an entry in the raffle giveaway. Email downtownchestertown@gmail.com. November 28 • 7:30 p.m. Play music on your own or with a band, read poetry, do a stand-up routine. The options are limitless. Email Ford Schumann at fordo1@aol.com to sign up, or for more information. There’s no price to come, and there’s always a cash bar. Donations are always appreciated. November 30 • 7:30 p.m. The WC Department of Theatre and Dance presents Dancescape. This performance is free and open to the public. Call 410-778-7888. November 30, December 1, 7, 8 • 8 p.m.
December 2, 9 • 3 p.m.
Director Bonnie Hill brings to the stage the classic story of “A Christmas Carol” as presented from the perspective of Tiny Tim. Tiny Tim is determined to have his father home for Christmas Day, even if it means teaching Ebenezer Scrooge a lesson in Christmas cheer. Adapted from the classic Charles Dickens novel, Tony award winner Ken Ludwig writes a heartwarming Christmas tale full of family fun! Directed by Bonnie Hill. For tickets, call 410-810-2060.